Happy #ThrowbackThursday from Nebraska Memories. With Memorial Day just around the corner, we thought this photograph would be a good way to start the weekend. This 5 X 7, black and white photograph, is a shot of the Liberty Bell on tour through the United States. 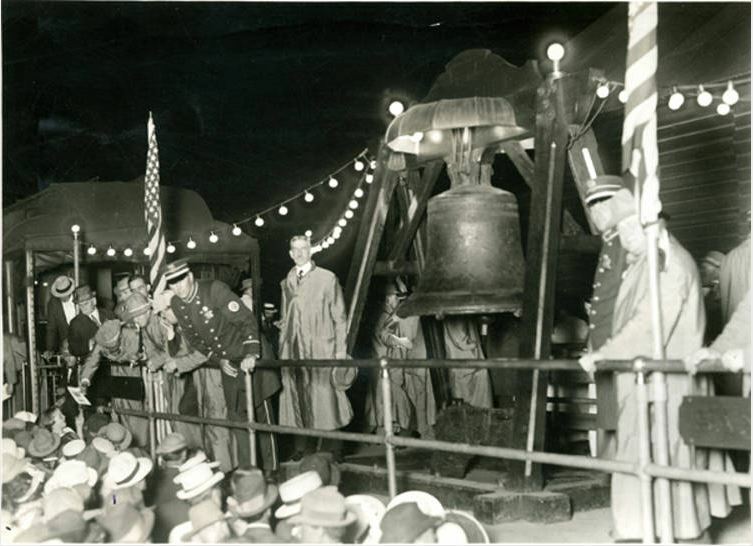 The photo depicts the bell on a railroad car flanked by two American flags with several military personnel and officials around it. It also shows the crowd of onlookers that came to see the bell. The train stopped in McCook, in July, 1909. The Liberty Bell crossed the country on a number of train journeys to be displayed at special events. This ended in the 1930s when it was determined to be too unsafe to move the bell from place to place. This photograph was provided and is owned by the High Plains Historical Society. The High Plains Historical Society and Museum and the McCook Public Library worked in partnership to digitize photographic images from the historical society’s collection. These images document early growth of the Chicago, Burlington & Quincy Railroad in McCook, Nebraska, and the surrounding area. The collection spans a time period from the early 1880s through the 1960s. Interested in Nebraska history? Find out more about this photo in the Nebraska Memories archive! Nebraska Memories is a cooperative project to digitize Nebraska-related historical and cultural heritage materials and make them available to researchers of all ages via the Internet. The Nebraska Memories archive is brought to you by the Nebraska Library Commission. If your institution is interested in participating in Nebraska Memories, see http://nlc.nebraska.gov/nebraskamemories/participation.aspx for more information.